Ancestral notes written by Orlando A.Mansfield in 1911. Ancestral notes written by Orlando A. Mansfield in 1911. The notes below were discovered among my Fathers papers and became the basis for a study of my English ancestors who I knew little about. However it was to prove more complicated than I imagined an only recently have I been able to publish the results with any confidence. On Sept, 28, 1911, received letter from Mr Mansfield-Haysom of Chard asking if I were descended from William Mansfield, son of John James Mansfield, Sheriff of S. Hants who died in 1762 and is buried in Ringwood Church with his two wives. Replied in the negative, saying that my father was born at Crediton, and was a Congregational minister – Rev. J. Pearce Mansfield. Considerable correspondence with W. Haysom followed, leading to perpetual acquaintance and friendship. 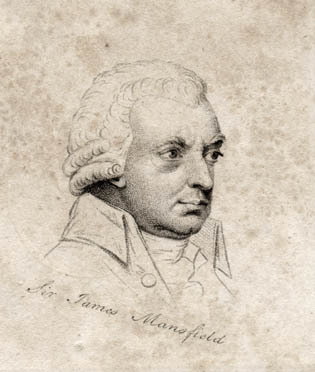 The correspondence decided new facts that John James Mansfield (originally Manfield and descended from the Manfield’s of Notts.) had by his first wife, Elizabeth who died 1740, 7 children of whom Sir James Mansfield (left) Lord Chief Justice of Court of Common Pleas was 3rd. He was the ancestor of the present Lord Sandhurst, and was born in 1734. William born 1735 had a son also William, born 1774. This William married a Mary Pearse, about 1800 and left for Devon where he was lost sight of. Richard Fezard* Mansfield. the 7th child of John James, born 1740, had two daughters, Elizabeth and Mary. They married two brothers called Haysom, solicitors at Ringwood, and from the eldest of their daughters Mr Mansfield – Haysom is descended. After the death of his first wife, John James Mansfield married one Grace who died in 1747. Her only surviving child, Charles Benjamin Mansfield, was born at Ringwood in 1745. He also was lost sight of by the other branches of his family. John James was a man of wealth, owning nearly a score of estates in S. Hants, sending his son, Sir James, to Eton and Cambridge. And leaving £32.000 to his son Richard Fezard alone. On Friday, Oct.13, 1911, I met Mr M-Haysom at Exeter, and proceeded to Crediton where assisted by the Church Minister Rev. S.E. Archbell, we searched the registers at the Parish Church, discovering that my Grandfather, William Mansfield was described on his marriage certificate as ‘of Culmstock’. He married Susanna Pearce Andrews, of Topsham, at Crediton, on Dec 7. 1812 and died at Crediton, Nov 23, 1851 aged 66 years. On Monday, Oct 16, 1911, we proceeded to Culmstock, where were kindly assisted by the Vicar, Rev. Tertius Poole. We discovered that William Mansfield came there from Ringwood, that his son William was born there in March 1808. This disproved the theory of descent from William Mansfield. There was no record of his death, which still remains a mystery. We also discovered that his reason for going to Culmstock was that the Mansfield’s had been there twice early in the 17th Century; that Benjamin was quite a family name; that they married into the Arundel family; and were country people of wealth and position. Not satisfied with the search made in such restricted time, W. M – Haysom returned on Monday, Oct 23, 1911 and made the startling discovery that Charles Benjamin Mansfield also came to Culmstock (there was a suggestion that he offended his family through his marriage) before his nephew William, and that he died there in 1810, aged 65. This agrees with the date of his birth: 1745 – 1810 = 65 years. But more important was the discovery that a son, William was born to Charles Benjamin and Mary Mansfield in 1786. This son was my Grandfather, of whose death in 1851 was evidently entered as 66 on his.birthday. After this we decided to secure some Cathedral evidence of birth, and to this end requested Mr Lloyd, LLB of Troubridge to search any records to which might have access. These efforts howevever.........................ENDS. With this information, and a with a little research using the LDS Family Search, I decided to retrace the journey my great grandfather made with his friend William Mansfield-Haysom and on September 2002, left Scotland for Devon. Our first stop however was at Horningsham in Wiltshire where we discovered the little church where the Rev. J. Pearce Mansfield had been pastor in the 1800's and despite being built in 1566, had hardly changed in appearance. Next stop was Wells in Somerset where we were able to find the convent where Orlando's sister Theodosia was a Carmelite nun - but that's another story! On then to Culmstock and the Parish Church and noted that the Rev. Tertius Poole (right) who had helped Orlando in 1911 was buried near the door of the church. However we did not find any gravestones in the churchyard that would help us with our quest for Mansfields. Next stop was Crediton and the Parish church there, however some research I had done before my trip South suggested that William and his family had become members of the Broad Street Independent Church. The church unfortunately had been demolished at the turn of the century but after making a few enquiries, we found the original graveyard behind some shops in the High Street. Again this did not yield any Mansfield names on the stones. It was clear that we would have to spend some time in the Library at Exeter where all the Parish records are now archived. What did they reveal? Basically, it simply confirmed the names and dates in Orlandos original notes, however there had always been a problem with our Williams birth date. The 1851 census has our William as age 67 which would make his birth year 1784 not 1786. An entry in the Culmstock Parish Register of Baptisms for the year 1784 has a William MANFIELD baptised on 11th April 1784 and was born "January last". He was described as son of Samuel and Betty. In the marriage registry for Culmstock, a Betty Perry married a Samuel Manfield on the 12th August 1781. Crediton Parish registers have a Samuel Mansfield baptised on May 23rd 1814, son of William and Susanna, woolcombers, Crediton. Their next son was christened William and other sons were Henry, James and Edward, no Charles's or Benjamins. We concluded that despite the slightly different spelling it was highly likely Orlando and his friend had got it wrong and had ignored the fact that names can be spelt differently from village to village. It might also explain, possibly through embarrsement, why the other pages of Orlando's notebook had been destroyed.